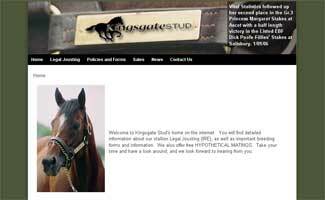 Kingsgate Stud - Created to showcase my own business. Built on a CMS platform, featuring online video and a form processing function. 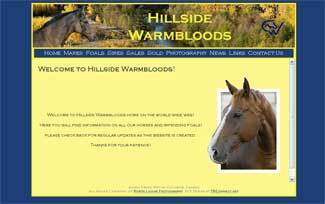 Hillside Warmbloods - Client wanted to showcase her small warmblood breeding operation located in British Columbia, Canada. Built on a CMS platform, allowing client to make their own changes and updates using a simple WYSIWYG editor. Thoroughbred Niagara - Designed and maintained website on a CMS platform. Logo design, implementation of online payment forms, banner ad rotation and PHP message board. Client has since moved on to another designer, and site has been redesigned. 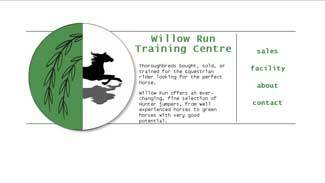 Willow Run Training Centre - Client wanted a site for sales listings, with available video. 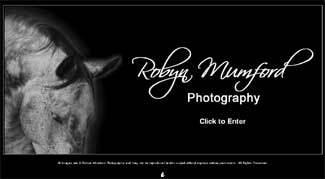 Robyn Mumford Photography - Developed initial site for client, continue to offer technical advice for updated site.